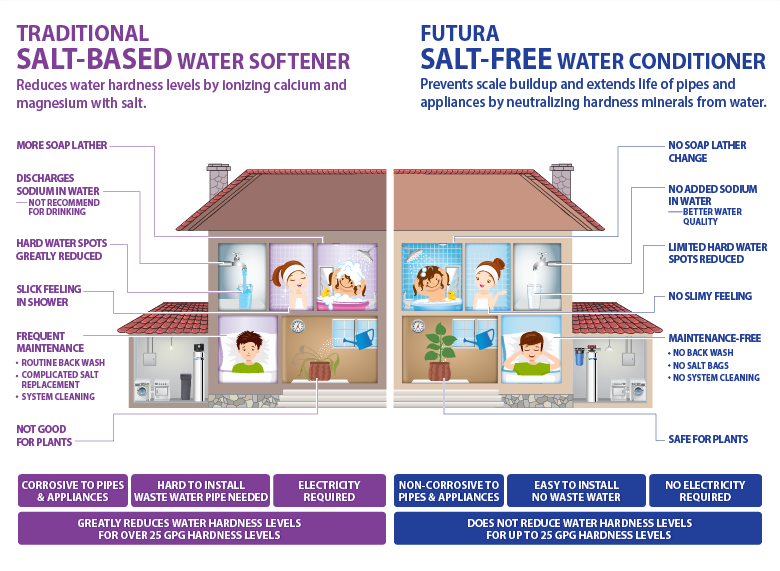 The FUTURA-10 is an excellent Salt-Less anti-scale water softening system. Perfect for homes with 1-3 bathrooms. Does not use salt, chemicals, or electricity. Reduces and prevents hard water scale from pipes, water heaters, tubs, showers and sinks. Protects and increases life expectancy of appliances. Use less soap and detergent while delivering greater cleaning effectiveness. You get conditioned water without the slippery feel. Easy install and requires no drain connection. No backwashing, no salt bags, no resins, no hassles. Virtually maintenance free! The FUTURA-15 is an excellent Salt-Less anti-scale water softening system. Perfect for larger homes with 3-6 bathrooms. Hard water scale reduction without the use of salt or chemicals. Protects and prolongs your hot water heater and appliances. Use less soap and detergent to save money and protect the environment. No electricity and no backwashing. Family-friendly system means no messy salt bags, sticky resins, no hassles. Maintenance free high performance. The FUTURA-20 conditioner is our top of the line anti-scale water softening system. Salt-Free system is perfect for larger homes or estates with 6 or more bathrooms. Does not use salt, chemicals, or electricity. Reduces and prevents hard water scale from pipes, water heaters, tubs, appliances, showers and sinks. Uses less soap and detergent for all your household chores. You get cleaner, scale-free water without the slippery feel. Easy installation and requires no drain connection and no backwashing. No salt bags, no resins, no hassles. Virtually maintenance free!